Toornament allows you to associate streams to your tournament. First of all, you have to indicate all your streaming channels. In your dashboard, select a tournament and access to the Settings section. Then, select the stream tab where you will be able to fill the streaming channels. Check our list of supported providers. 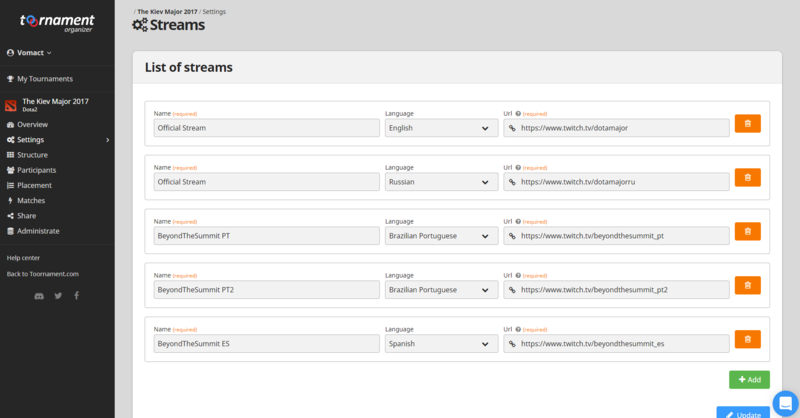 Toornament goes deeper by allowing you to associate the streaming channels to each match of your tournament. Select a match in the Matches section and then, click on the stream button in the top-right corner. You are now able to select specifically the streaming channels which will broadcast this match.